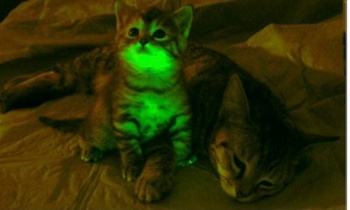 A US researcher has produced three genetically modified cats which, unlike regular cats, happen to glow green when exposed to certain frequencies of light. The cats, which are adorable in my entirely scientific opinion, were created using a virus that carried genetic information into the eggs from which the minute glowing fluffballs sprang. The gene, called green fluorescent protein or GFP, originated in Jellyfish and is frequently used as a genetic marker to "tag" different proteins, making them glow under fluorescence microscopy. Glowing cats, along with a whole range of different fluorescent animals, have been produced before via traditional cloning techniques, but this marks the first time gamete-targeted transgenesis has been used on a carnivore. So, what use is there for a (kind of) glow-in-the-dark cat, save the possibility of it being the first step in developing a breed that won't trip you up on your way to the bathroom in the middle of the night? According to Helen Sang and Bruce Whitelaw of the Roslin institute at the University of Edinburgh, which science-savvy readers might recognize as the birthplace of the now-deceased Dolly the sheep, the research paper suggests that the new technology be used to develop GM cats for purpose of studying feline immunodeficiency virus (FIV). "Cats are susceptible to feline immunodeficiency virus, a close relative of HIV, the cause of AIDS," said the professors, but they did point out that the uses of genetically modified cats as models for human diseases are "likely to be limited and only justified if other models - for example in more commonly used laboratory animals, like mice and rats - are not suitable." While it may be upsetting to think of these cats being used in medical experiments because "aww just look at its little face, look at it," Dr Robin Lovell-Badge, head of developmental genetics at the Medical Research Council's national institute for medical research, pointed out that cats are one of the very few animal species susceptible to viruses like FIV, and that "understanding how to confer resistance is ... of equal importance to cat health and human health." Regardless of the scientific implications, I can certainly see a market for fluorescent cats, particularly in the now aging raver demographic.